Having already blogged about the Ref. 5510 and the Double Red Sea-Dweller (Ref. 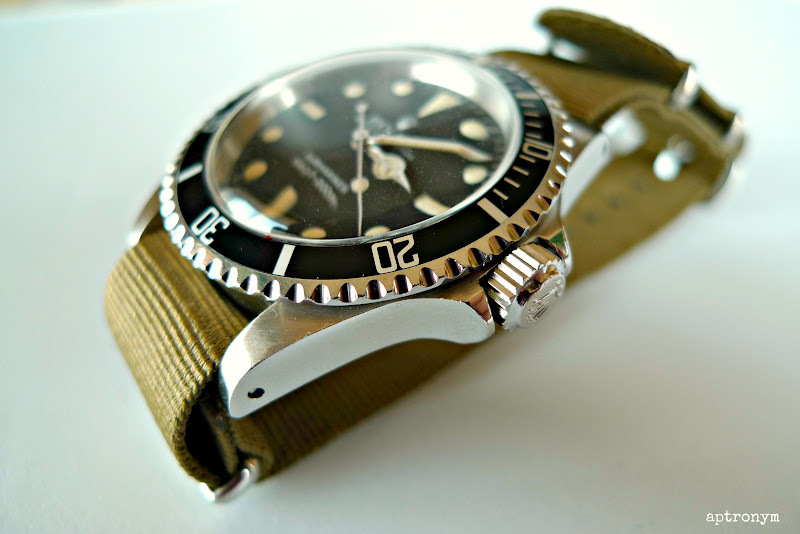 1655), today’s classic Rolex is the Ref. 5513 Mark IV. 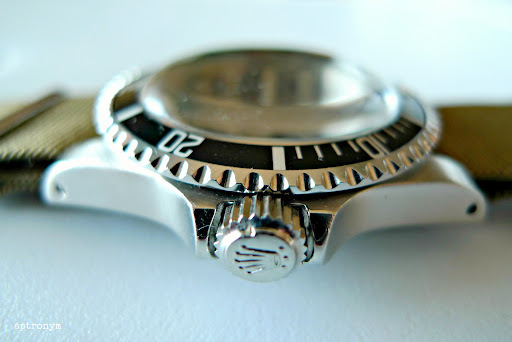 To read about the beginnings of the Rolex Submariners, go to the Ref. 5510 link above, but as was mentioned there by TonyC the 5510, which had a short production run (est. third-quarter of 1958 until late 1960), was replaced by a larger cased 5512/ 5513 (COSC/ non-COSC). The 5512 and 5513 were both fitted with the oversized crown which became a standard feature of the Submariner line, and came initially with a pointed crown guard, but later changed to the more rounded crown guard. Sometime in the early 1960s, Rolex discontinued the use of radium paint for the indices, switching to the safer Tritium. The 5513 was produced from 1962 through until approximately June 1990. It used Calibres 1520 and 1530, and the latter appeared in both the 5513 and 5512 for a time. Early dials from the 5512 and 5513 had what is called a ‘gilt’ dial, referring to the fact that the colour of the text was gold. 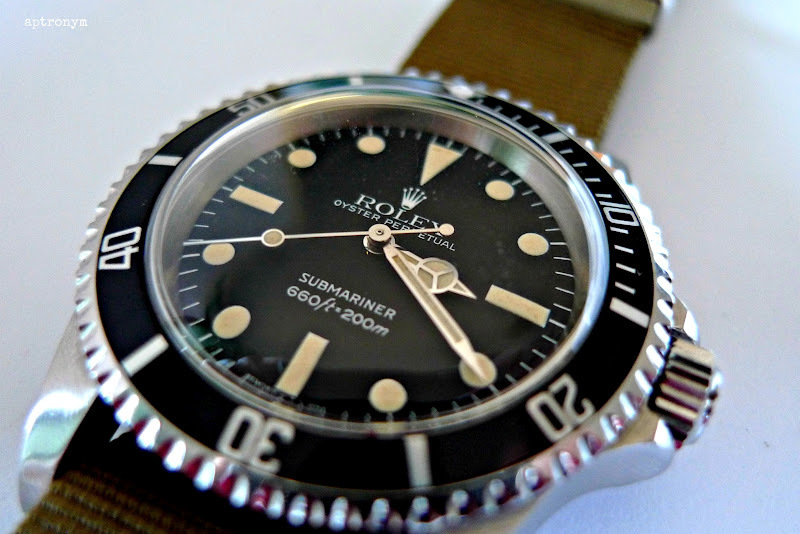 Around 1965 or 1966 Rolex discontinued the use of gilt dials on the Submariner watches and switched to white printing. This is 5513 MK IV ‘maxi dial’ with a 7.9mil serial, from about 1983. The bezel is sharp, the dial and indices in remarkable condition. What is a ‘maxi dial’? Well the term was first used by Rolex at Baselworld 2003 to describe the larger luminous dots on the Reference 16610LV. It was then appropriated retrospectively by vintage Rolex collectors for vintage Royal Navy Submariners, and then taken back even further, chronologically, to refer to older Submariner models. A close examination shows that the post-1975 maxi dials share two characteristics: larger lume dots and generally bolder text, especially for the depth rating and ‘Submariner’. 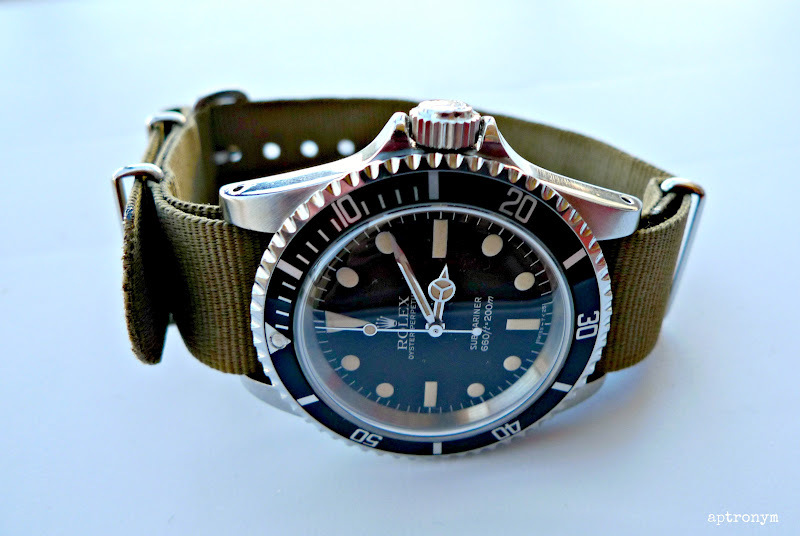 The Type IV shown in these photos is the second-to-last known style of matte dial for the 551x reference, showing up on Subs with high 6 million case serials until around about the late 7 millions. Even if you’re not an old-school Rolex fan, you have to admit that this is in pretty damn good condition, and a classic versatile watch. 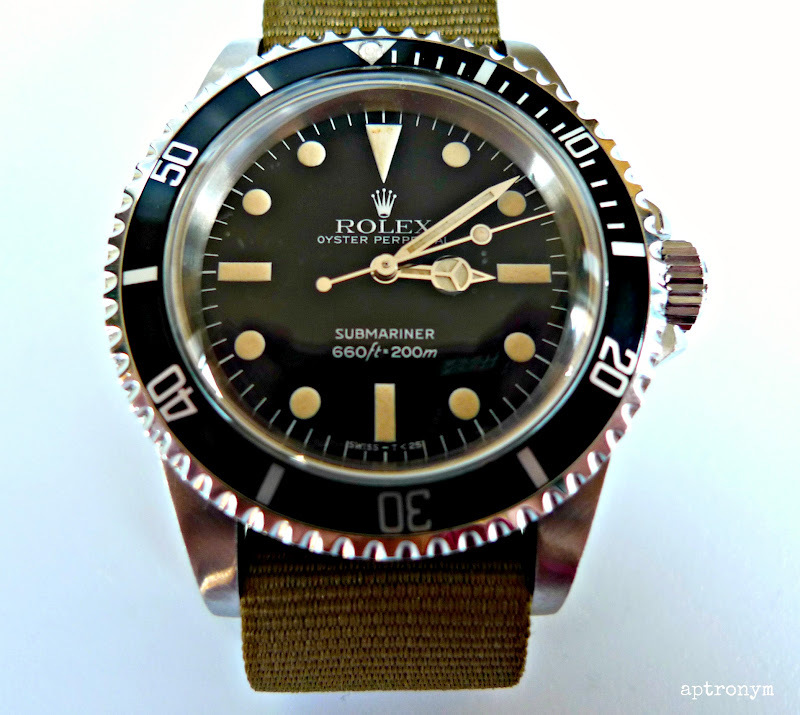 So … have we turned you into a possible vintage Rolex sports watch enthusiast yet? What a beautiful watch!! the NATO watch band makes the watch itself stand out even more!